Shocking new dashcam footage shows the moment an elderly motorist drove – and reversed – the wrong way down the M1’s outside lane. 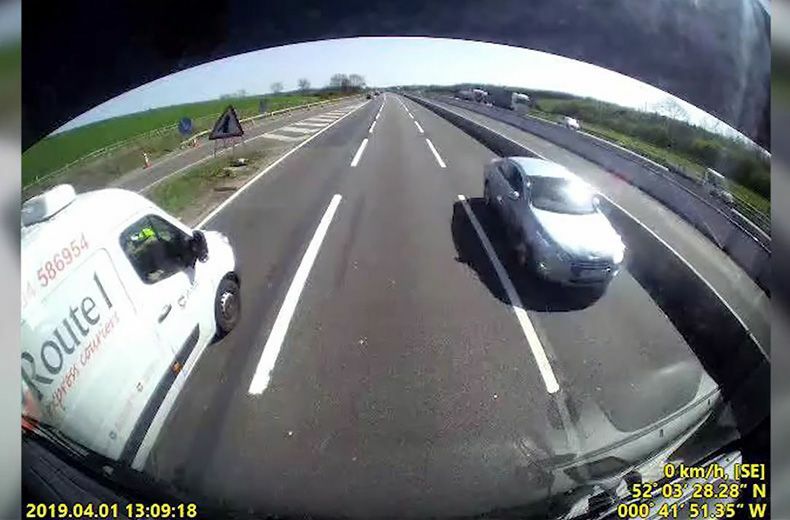 The driver is seen turning off a slip road near Milton Keynes and into oncoming traffic, crossing two lanes before driving the wrong way down the overtaking lane. Flagged down by other drivers, the motorist realised his mistake and put his car in reverse, heading back up the motorway before driving the wrong way up the slip road. Miraculously, no-one was hurt in the incident which took place on the southbound M1 around 1pm on Monday 1st April. He said: “I was driving in the middle lane and noticed in the distance [something] was not quite right. I was doing around 60mph when I saw the car coming up on the fast lane, and slowed down to 40mph in an instant. The dashcam footage will add to the debate around older drivers on the UK’s roads, following Prince Philip’s involvement in a collision outside Sandringham earlier this year. Prince Philip was unhurt in the crash, which left two other motorists with minor injuries, and voluntarily gave up his licence following intense media coverage. For more information on driving over 70, read the RAC’s guide.